The fourth chakra, the heart chakra is known as Anahatta in ancient Sanskrit. It is located right in the center of the chest. Its energy flows out of the front of the chest and to a lesser extent also out of the back at a point directly behind. This chakra is all about love and feelings. Love in its purest sense. The heart chakra represents a balance in relationships, links with others and with oneself. It is literally the center of our being, both physically and psychologically. When this chakra is activated fully it benefits the heart and the lungs. If the chakra is blocked it can cause breathing problems, high blood pressure and even heart related ailments. 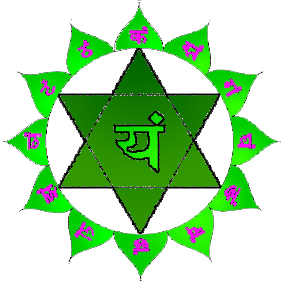 The associated colors for the heart chakra are green or pink. The way it is used in the healing chakras CD is that when the meditation is working its way up, activating the chakras from the bottom up then the color to activate it is green. Once all the chakras are open and active then on the way back down the body, the color best suited for bathing the already open chakra is pink. Its element is air and the metal associated is Tin. Its gem stones are rose quartz, green quartz or emerald. When you use these stones, especially the rose quartz, which is has a very loving energy, they can help us to transmit loving vibrations which will help to heal the wounds of the heart. It can teach us to accept and to love. They can also help us to see the love in others and appreciate them more. These stone can also stimulate creativity and fantasy at the same time as balancing us emotionally. When the heart chakra is in balance, the psychological aspects can be compassion, acceptance of what cannot be changed and a great general opening up emotionally. The psychological aspects of the heart chakra when it is out of balance are low self esteem, loneliness, sadness and a closing up emotionally. To balance the chakra you can use meditation music in the key of G and imagine a ball of gentle green light centered around the area of the chakra. Imagine a 12 petalled green lotus flower opening slowly and rotating over the chakra. This 12 petalled green lotus flower is represented in the Sanskrit Mandala for the chakra. The fifth chakra is the throat chakra and is called Vishudda in ancient Sanskrit. It is positioned the the center of the throat. The energy from this chakra flows out of the front, just under the chin and also a little less intensely from back of the neck. This chakra is to do with communication, speech and expression. The throat chakra represents a will to communicate harmoniously that which is inside oneself to others and the use of that energy in a creative way. With a fully activated throat chakra speech can come easily and thee is a willingness to communicate with others. With this chakra blocked then throat problems in general can arise along with loss of voice, neck problems and sometimes shoulder problems too. When the throat chakra is in balance, the psychological aspects manifest as a development of artistic talent and elevated spirituality. The psychological aspects of the throat chakra when it is out of balance can be getting blocked, obsession, repression of speech, creative blocks and not being able to express yourself. 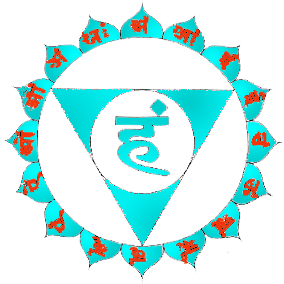 To balance the chakra you can use meditation music in the key of A and imagine a sphere of turquoise blue light around the area throat. Visualize a 16 petalled blue lotus flower slowly opening and rotating over the chakra. This 16 petalled blue lotus flower is represented in the Sanskrit Mandala for the chakra. 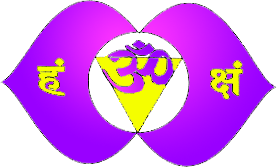 The sixth chakra is the third eye chakra and in the Sanskrit language is referred to as Alna. It can be found right in the center of the forehead, just between and slightly above the eyes at the level of the eyebrows. It also has a corresponding point at the back of the head. This chakra is about attaining a clear vision of events, of knowing instinctively and of awakening the sixth sense. The third eye chakra represents the power to communicate with your inner self and your intuition. If this chakra is activated and open, it can help you to get in touch with your inner self, your intuition will become more finely tuned and it can allow you to learn to let the messages of the brain flow easily thus allowing a direct connection to the cosmic consciousness. When this chakra is blocked however then there can be mental imbalance along with insensitivity and an inability to accept new ideas. The color associated with the throat chakra is indigo blue and its metal is Silver. The principle stone for this chakra is Sodalite. Sodalite clarifies understanding, it can bring a serenity and can strengthen the nerves. It can help greatly in dissolving old and obsolete behavior patterns whilst providing the strength and confidence to defend ones thought patterns in the environment of our daily life. It can help to clear the mind and to achieve rational thinking. When the third eye chakra is balanced, the psychological aspects can manifest as psychic development, an intellectual lucidity and extra-sensorial perception. When the chakra is unbalanced the psychological aspects can manifest as inability to use the intuition, disbelief of dreams, an inability to visualize and intellectual blockages. It can cause headaches and confusing thoughts. To balance the chakra you can use meditation music in the key of D and imagine a sphere of indigo blue light between the eyebrows. See a 2 petalled indigo lotus flower slowly opening and rotating over the area. This indigo lotus flower with its 2 petals is represented in the Sanskrit Mandala for the chakra.